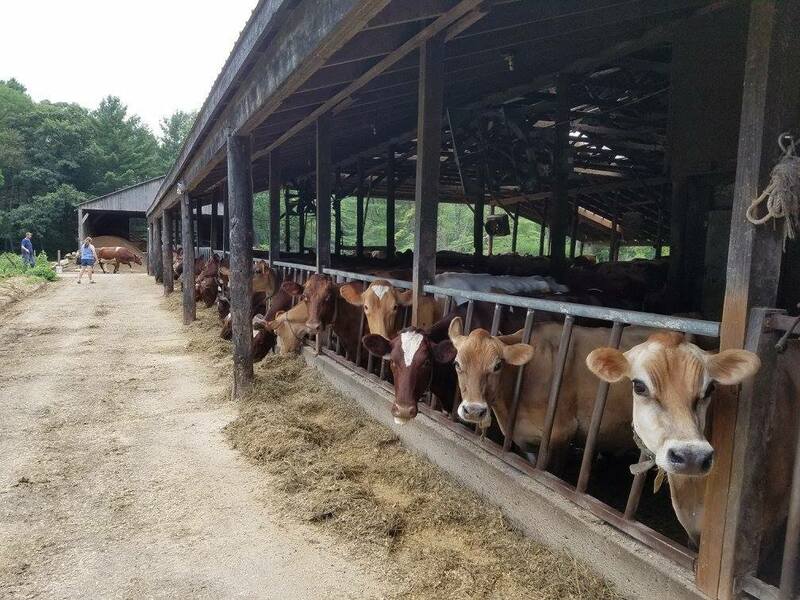 Last week our Outside Sales team embarked on a tour of a select group of farms and purveyors that we work with in southern Vermont and southern New Hampshire. It was a great learning experience for us all. Unfortunately we picked the two hottest days of the year! We started the day at Harlow Farm Stand in Westminster. Evan Harlow showed us around the farm and we took some wagon trails into the woods to some of his remote fields as well The farm is old school in many ways but slowly modernizing. We were very impressed with the fields themselves. You can visit their stand on Route 5 to see for yourself. From there we headed south to Scott Farm Orchard in Dummerston, Vermont. Zeke Goodband is the closest thing to Johnny Appleseed you will ever find. He is a wealth of knowledge on apples. They offer a couple of tasting days in the fall if you would like to check them out. You can also go to their store in season or even join their apple CSA. We took a tour of Commonwealth Dairy where they make Green Mountain Creamery Yogurt. The plant is state-of-the-art and spotlessly clean. It is pretty amazing how much yogurt they make there. We ended the day with a trip to Echo Farm Puddings to see the cows that make the milk to make the pudding. This is truly "farmstead" pudding in that it is made on the farm from milk produced on the farm. The cows were pretty funny as they all have names and personalities. Some were escaping while their pals were warning them vocally that they were not obeying the rules. We had the opportunity to watch some bad cow behavior as they were repeatedly escaping and getting chased. Maple pudding is on its way very soon, so keep your eyes peeled! To learn more about some of the farms that Black River Produce works with, please see Farms and Partners. This Friday we will have a table set up at the Springfield Food Co-op offering free samples of Black River Meats. We will be offering our newly released line of Hot Dogs, Sausages, and more. Stop in and try some from noon til 2pm.